If only the rest of the team played as well and consistently as our wide receivers. Keenan Allen is on pace for a record-setting season while Marvin Jones is making tough catch after tough catch. Keenan Allen has currently 5 less yards than his total number of yards all of the 2010 season and has tripled his yards per game. Both Keenan Allen and Marvin Jones are on track to have 1,000 receiving yards this season. 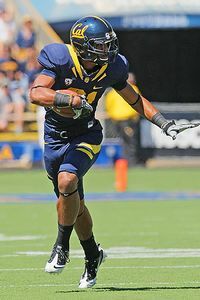 Keenan already has a school record with his 90 yard touchdown reception against Washington. Both Keenan Allen’s and Marvin Jones athleticism has been able to keep the Cal’s offensive drives alive and exciting. Even backup receiver Michael Calvin is pretty solid this season as he has already made key catches. The reason why Zach has been able to get out of 2nd or 3rd and longs is because of the abilities of Keenan Allen and Marvin Jones. Less drops. There has still been way too many easy dropped passes from the Cal receivers. Hopefully Coach Eric Kiesau can fix up those issues before Oregon. Other than that, the receivers are definitely the best performing players on the entire team. 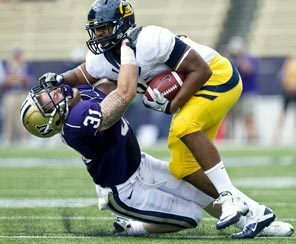 They will need to continue their efforts against much tougher defenses throughout the entire season if Cal is to make a decent bowl game. Assessment of WRs so far: A, so far so good and all they need to work on is concentrating on not dropping easy passes. Anthony Miller have seen the majority of the snaps, but only has 6 receptions and 2 touchdowns. There has been a good number of plays where he has gone out as a receiver, but was only the third option. Miller still needs to work on his pass protection as he has gotten beat by faster pass rushers. Spencer Hagan has gotten most of the other snaps, but only had 1 reception, which was also a touchdown. He has been mostly been used as a half back and a third option on pass plays. Better protection for Zach Maynard. The tight ends need faster hands and feet to give themselves better positioning against fast defenders. Both Miller and Hagan have great hands, but Maynard has not gone to them much, most likely because the wide receivers have been so productive. Maybe Coach Jeff Genyk is too busy fixing the special teams, but he will need to put more work on perfecting hand and foot technique with the tight ends. Assessment of Tight Ends so far: B-, there are a lot of room for improvement, but they have been mostly decent in execution.